It's always after a long day of stressful antics, when I feel drained of every last bit of energy, that I often lay down at night and think, "I want a getaway!" And then I roll over and wrap my arms around my saint of a husband. There in his embrace of comfort and safety is where I start to let go of all the days hassles and stresses. The tension slowly dissolves and I'm reminded that these really are the best days of our lives...hence my post a couple of weeks ago. Over the last few months, I've been getting our home in order. When we first moved in over 2 years ago, I had a vision and plans for every room in the house. But finding out that I was pregnant a week after moving in, all of those plans (besides a nursery) sort of got put on the back burner. And it feels good to have our home feel cozy and welcoming after such a long time. I finally painted the kitchen a nice shade of "Lamb's Ear" and I now have furniture in my dining room. After months of looking at carpets, I found one that fits my living room perfectly and new bedding in the bedroom has both Ty and I begging to stay in bed for 5 more minutes every morning. Ty even bought a lawn tractor that he's been wanting. Of course, all of this costs money and even doing things over time, my shopping can become costly. But lately, I've started to feel as though something is missing. Every so often I get this feeling and it's always dead on in directing me towards something that is calling to me. You would think that as all of this house stuff comes together that I would make me feel more complete. And yet it's only been the opposite. Yesterday was a doozy of a day. It was about noon and already it felt as though it should be 4pm. Maxwell has some teeth coming in and I also suspect a growth spurt. No sleep was to be had the night prior and I pulled out all the tricks to get him to nap. Nursed him, walked him, rocked him....finally he fell asleep around 12:30 and I laid him down in his crib before tiptoeing out of the room. I looked around my home and tried to think of all the things that I needed to get done before Maxwell woke. And in the amount of time that it took me to think of 50 different things, I heard a cry come from upstairs. As I walked in to pick up my sweet boy, I saw his little arms reaching for me. I picked him up and he instantly laid his head down on my chest. Side to side I rocked, standing in front of his crib. There in that moment of love and a little bit of frustration, I felt it. A little feeling of need in the mundane. I couldn't quite put my finger on what it was but as I looked up, it was if my question had been answered. 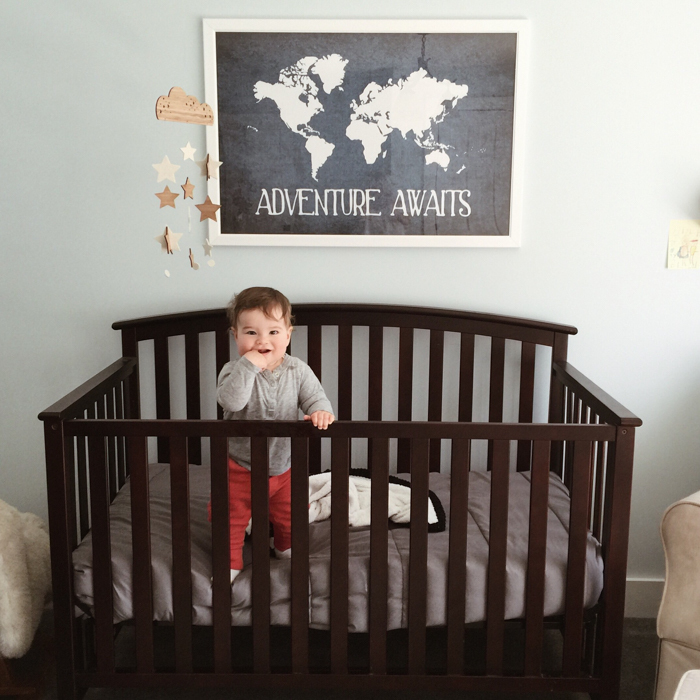 I read the artwork above Maxwell's crib that read, "ADVENTURE AWAITS". That was exactly it. I smiled a little knowing I had figured it out. I need some adventure in my life!! Often parenthood can drain you in many ways. At times you can even start to lose yourself a little bit. We are so busy playing the role of "parent" that it's natural for that to happen... And it's important to revive yourself now and again. I took a little time to think about things and it dawned on me that all of the material things that I spend money on are not contributing to much happiness. I really want to stop buying THINGS and start finding more ADVENTURE. I think that is what I've been yearning for without even knowing I was lacking something. I've made it a point that when I want to buy something frivolous, I instead put it aside so that we can take our two young children away for some memories. I want to let the kids be part of the experience and have them help me plan it. Well, Scarlett anyhow. Every time that we have taken the kids away for a trip, the kids have enjoyed it so much. Maxwell has been doing small trips with us since he was born. He is a traveler like me. He enjoys being on the go. Scarlett and Ty are home-bodies but I know that they too enjoy some adventure. I look forward to planning some fun times with these babes and my husband. As I'm planning and saving with the kids, we'll be looking forward to our future trips, because well....Adventure awaits. I agree........I need to do this ......like cutting my spending in order to do more things...see more things.....go more places. We splurged on a 10 day vacation to Puerto Rico this July so Im stoked ....this will be our first trip in a long time!